The year is 1818, the city is London, and our heroine, 16-year-old Annis Whitworth, has just learned that her father is dead and all his money is missing. And so, of course, she decides to become a spy. Annis always suspected that her father was a spy, so following in his footsteps to unmask his killer makes perfect sense. 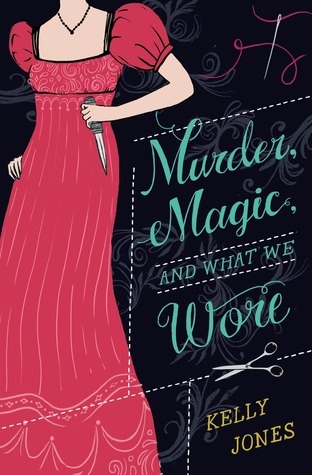 Alas, it does not make sense to England’s current spymasters—not even when Annis reveals that she has the rare magical ability to sew glamours: garments that can disguise the wearer completely. Well, if the spies are too pigheaded to take on a young woman of quality, then Annis will take them on. She’ll follow the clues her father left behind and discover what befell him. She’ll prove she can sew an impenetrable disguise. She’ll earn a living without stooping to become a—shudder—governess. One of the things I loved best about this book was the use of quotes under the chapter headings. I am such a sucker for this. There can never be too many quotes introducing a chapter or section of a book in my opinion. I also loved that the author’s use of quotes to introduce/capture the theme of a chapter was on point. I have read a couple of books recently that introduce a chapter with a quote, and fail to tie it in in any meaningful way. That is super annoying. This book does not do that. The quotes are treasure, especially the ones from Hypatia. Okay, I think I have rambled on enough about chapter headings and quotes, so on to my review! Woohoo! Regency-era fashion plates courtesy of this Pinterest page. The story is set in Regency-era England, a few years after the Napoleonic wars, and yes, the author evokes the period as successfully as any Jane Austen novel. Also like Jane Austen novels, this story unfolds between sisters, around threats to delicate female sensibilities, and under the burden of the ever-looming question of how a woman can make her way in the world without marriage. Question: Would you have fit the bill of a proper Regency-era lady? Read this blogpost to find out! The female protagonist, Annis Whitworth begins the story somewhat aloof and then evolves into a perceptive and courageous character who is entertaining throughout. The mysterious death of her father forces Annis and her sister to take inventory of their romantic and financial options, setting the stage for a humorous and action-packed adventure of carriage rides, garment fittings, clandestine meetings, society balls, and spy missions. In pursuing self-preservation and information about her father’s mysterious death, Annis discovers powers she never realized she possessed, in addition to stumbling upon a world of government plots and espionage, manipulated by magic. The scenarios Annis finds herself in evoke images from the 2016 book-to-film, Pride and Prejudice and Zombies. The pace of the novel was slower than I anticipated, but it allowed for luscious descriptions of glamorous garments, world building, and character development. The novel also flirts with a romance between Annis and an unreliable male character. The author is no doubt planning on giving more page time to the romance in book two of this new series. If you read this book and loved it, or if you are interested in books of this style to add to your TBR list, check out the fantastically fun Palace of Spies series by Sarah Zettel. Analysis of Regency-era Country Dancing courtesy of Wikipedia. Kelly Jones is a former librarian and bookseller and has worked with writers of all ages. She lives near Seattle, Washington with her partner and their chickens, who’ve shown no signs of magic — yet.